EU and Japanese leaders committed on Tuesday (21 March) to conclude a trade deal "as soon as possible" in an effort to defend a world order disrupted by the new US administration. "We remain united by our common values of liberal democracy and the rule of law as the core principles of the rules-based international order," European Council president Donald Tusk said before meeting Japanese prime minister Shinzo Abe in Brussels. He noted that Japan and the EU "are tied deeply together by [a] mutual commitment to maintain an open, free and fair global trading system". Abe visited Brussels as part of a tour to meet European members of the G7, ahead of a planned summit of the rich nations' club at the end of May in Sicily. This will be the first of such summits to be attended by US president Donald Trump. In response to Trump's support for Brexit and his questioning of Nato, the Japanese leader expressed his support for a "strong Europe" and for the EU's "cohesion of Europe as a whole, including on the security front". He added that Japan, the EU, and the US should "work hand-in-hand to maintain and reinforce" the international order and "cooperate to show to the world the flag of free trade as a model". 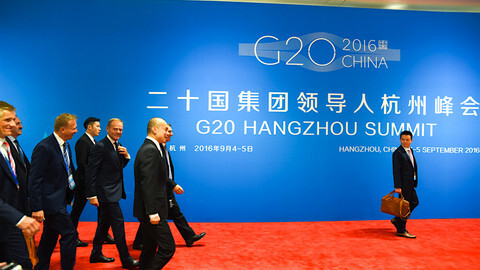 The message comes three days after the G20, a broader forum of wealthy countries, at a finance ministers' meeting in Germany, dropped its pledge to fight protectionism under US pressure. European Commission president Jean-Claude Juncker said before the Abe meeting that negotiations were now in a "decisive and hopefully final stage". He said that he expected a "comprehensive, ambitious and balanced deal" but noted that "there are few remaining issues but [that] they are the most difficult to solve." Talks on the trade deal started in March 2013, but 17 rounds of negotiations have not yet led to a final agreement. For the EU, a deal with Japan, the third largest world economy, is a priority to allay criticism of its trade policies and to compensate for the failure of talks for an agreement with the US. 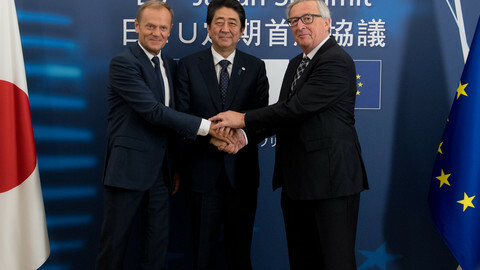 "The agreement will give Japan and the European Union the best of both worlds," Juncker said. "It opens up a major new market to each other by creating a level playing field and protecting our industries and work forces from unfair trading practices," he said, five months after a similar deal with Canada was criticised for threatening EU standards and workers' rights. 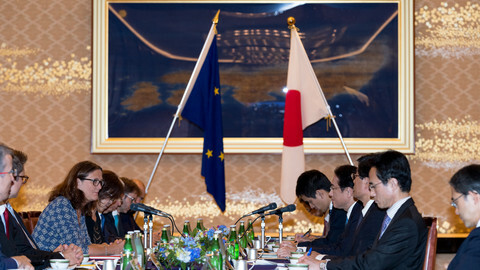 While EU officials hope to conclude the deal this year, the Japanese side prefers not to give deadlines. "Shinzo Abe would like to achieve an agreement in principle at the earliest time as possible," a Japanese spokeswoman told a group of journalists after the meeting. She said that during their 50-minute talks, the three leaders expressed their commitment to conclude a deal but did not delve into the blocking points. 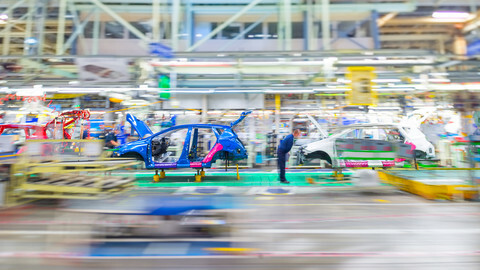 According to EU sources, progress was made "across the board" in previous rounds of talks, but negotiations remain difficult in sectors such as market access for food and cars, services, public procurement, and intellectual property. A new round of talks is planned for April in Tokyo to take stock of the negotiation with the aim of intensifying the process afterwards, according to an EU official. Washington and Tokyo say trade relations with the EU are more important to them than those with Britain in the context of Brexit. 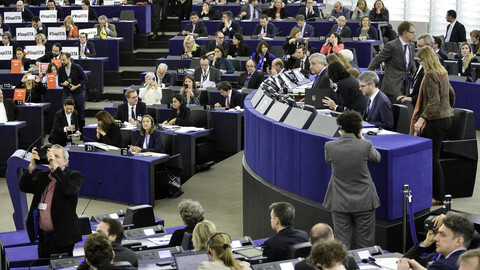 Amid protests in front of the European Parliament's Strasbourg building and after heated debate among MEPs, the landmark trade deal with Canada was approved with a comfortable majority. 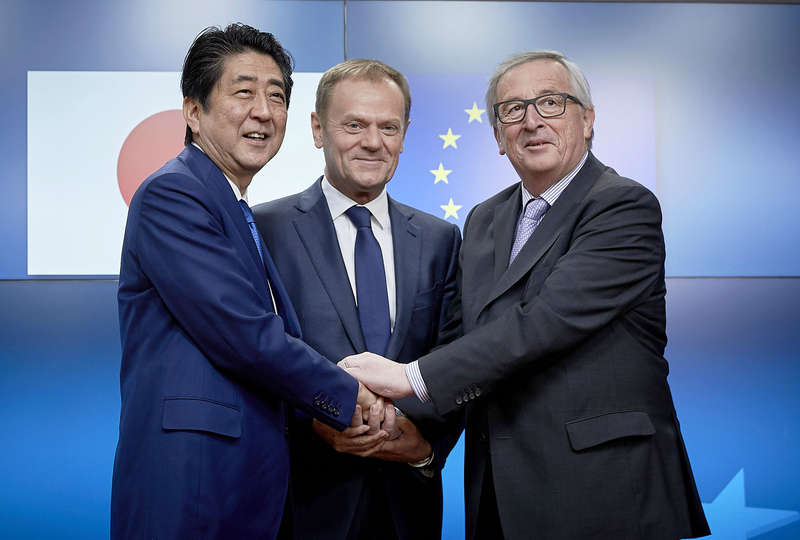 [Updated] The EU and Japan edge closer to securing a free trade deal on Thursday, ahead of the G20 summit at the end of the week where US protectionism will be an issue. Japanese prime minister and EU leaders to endorse major trade deal on Thursday in anti-protectionist message to Trump. EU and Japanese leaders hailed their agreement on free trade as a rejection of protectionist trends. The two sides still need to agree on investment courts for the deal to be concluded.